Before we get to Susan Rice, first things first. Every scandal needs a catchy nickname so we can avoid repeating drawn-out descriptions. One-word nicknames are best, especially for those who traffic in tabloids and television. Absent a better choice, this one shall be known as SpyGate. Spy because there is mounting evidence the Obama administration spied on Team Trump. And Gate because ever since Watergate, big scandals and wannabe big scandals must be Gate. It’s a rule. We also need a memorable question or two that points toward the endgame. When Richard Nixon’s fate hung in the balance, the case turned on these: What did the president know and when did he know it? In SpyGate, the crucial question is this: How do we know that the Obama spying on Team Trump was incidental? What if it was intentional? What if spying was part of a plot to destroy Trump’s candidacy and, when that failed, sabotage his presidency? We don’t have verifiable answers yet, despite being assured repeatedly that Trump and his associates merely were picked up in conversations with Russian and other foreign officials who were being spied on. Those doing the assuring said that since the Trumpsters were not the targets, it was incidental and thus no harm, no foul. But there were lots of harms and fouls. For months, stories about possible collusion between Trump and Russia turned exclusively on leaks about members of Trump’s inner circle being caught talking to Russians. Gen. Mike Flynn was the first example, Attorney General Jeff Sessions was second and others include Jared Kushner. Those leaks, always from anonymous officials, serve to undermine the new president and encourage Democrats to obstruct the administration in the hope that impeachment is coming. Which gets us to Susan Rice and the importance of her role in seeking the unmasking of those Trump officials. 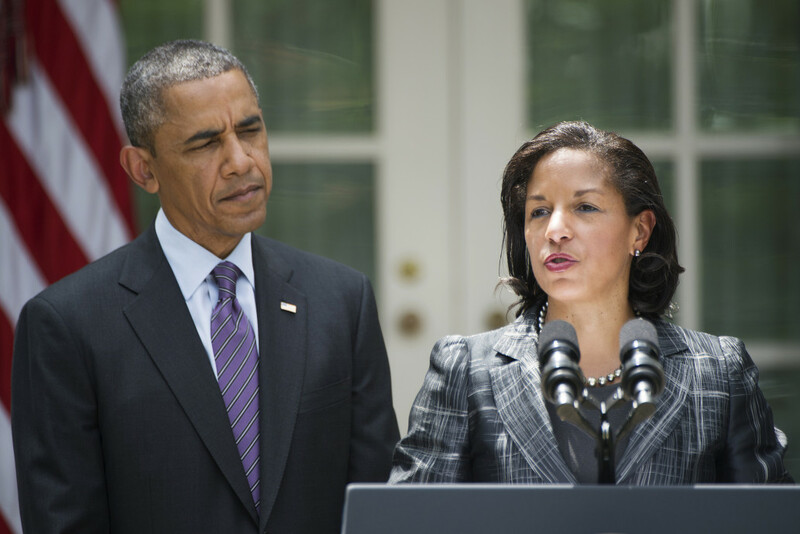 Weeks after she denied any knowledge of unmasking, Obama’s national security adviser flip-flopped Tuesday and admitted she had “sometimes” asked intelligence agencies to identify American citizens whose names had been withheld, as required, in initial ­reports. “And sometimes, in that context, in order to understand the importance of the report and assess its significance, it was necessary to find out, or request the information as to find out who that US official was,” she told MSNBC. Count that as one mystery solved. But Rice made two other denials. One, that she didn’t leak any names to the media. And two, that the unmasking was never done for political purposes. Her track record doesn’t help her credibility. Rice infamously went on five Sunday television shows in 2012 to assure the nation that the Benghazi attack that killed four Americans was in response to an Internet video. That was a flat-out lie — it was a planned terror attack and she had to know as much. She also brazenly insisted in 2014 that Bowe Bergdahl, the Army sergeant held by the Taliban for five years, had “served with honor and distinction” to justify the trade of five terrorists from Gitmo for his release. Her claim was false, and even the Army disagreed with Rice, charging Bergdahl with desertion. So when Rice and her defenders insist that SpyGate is much ado about very little, that’s not even close to good enough. She has to prove it — by testifying under oath to Congress. A grand jury is also necessary. Along with Evelyn Farkas, the former Obama Defense Department aide who admitted the widespread dissemination of surveillance data and the leaking of names was done because the Obamas didn’t trust the Trumps, Rice has opened the door to a criminal investigation. The leaks are federal crimes and the Justice Department must find the guilty and hold them accountable. Given the animus of Obama and Clinton toward Trump, it doesn’t seem at all far-fetched that the surveillance of the current president was intentional and designed to undermine him at every step of his rise to the Oval Office. Two other points. First, Rice, in her interview, wanted her actions to be seen in context. That doesn’t help her either. Obama was notorious for spying on the media and foreign allies, such as German Chancellor Angela Merkel, even as he pledged to safeguard the privacy rights of Americans. Clearly, he violated those rights in this and other cases. The administration was also notorious for weaponizing the federal bureaucracy against political foes. Recall how Lois Lerner initially conceded there was a wide attempt in the IRS to deny tax advantages to conservative groups before Obama himself declared there was not a “smidgen” of corrupt intent. Remember, too, how Obama insisted he learned that Hillary Clinton used a private server through the news media, which wasn’t true. And how he excused her reckless handling of national-security secrets as a “mistake” that caused no harm or risk to the United States. All that is also context, so we can’t be confident when Obama apologists say the Trump spying was ­“incidental.” Given the animus of Obama and Clinton toward Trump, it doesn’t seem at all far-fetched that the surveillance of the current president was intentional and designed to undermine him at every step of his rise to the Oval Office. We will only know the truth if there are thorough investigations by Congress and the Justice Department. I suspect they will find that the Obama administration abused its surveillance power for political purposes, and broke the law. Finally, what we know so far vindicates the importance of Trump’s victory. Had Clinton won, she would have covered up the surveillance of her ­opponent and expanded Obama’s use of the intelligence apparatus to punish opponents. In other words, a Hillary Clinton presidency still would have been the worst possible outcome.